Neil Diamond, The Experience is an amazingly close tribute to the legendary star Neil Diamond. 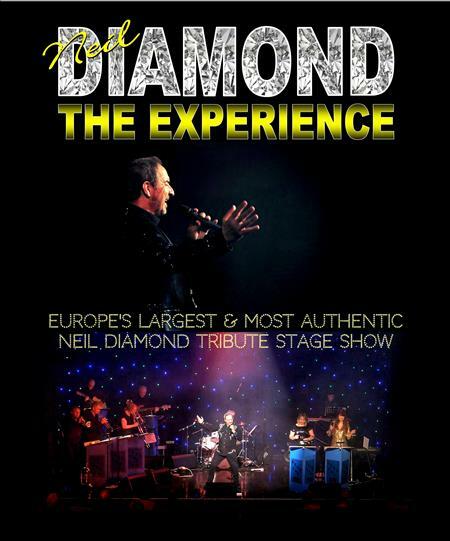 Featuring the official UK #1 Neil Diamond tribute singer Dominic Kaye and an 11 piece ensemble formed from the musicians of the internationally renowned Opus One band, the show is Europe's largest and most authentically presented tribute stage show to the great singer/songwriter. Dominic Kaye spent over 18 months perfecting his vocals and performance for his Neil Diamond tribute show before accepting his first booking! He uses an authentic sounding Brooklyn, New York speaking accent and his stage presence is simply outstanding. Long gone is the cliched 1980s look with the wigs, sparkly blue shirt and silver scarf... Dominic prefers giving authenticity to his show which is why he adopts a more current Neil Diamond look when on stage. Performing all of the greatest hits such as America, Forever In Blue Jeans, Cracklin' Rosie and many more, the show guarantees to have the audience singing along and dancing in the aisles!